I will be giving away one kids backpack filled with Tree Top applesauce pouches. View Rafflecopter at the end of the post to enter! This is a sponsored post from Tree Top applesauce and all opinions are 100% mine. As parents we all experience those moments when time gets away from us. It takes longer at the grocery store than planned, soccer practice runs late, or the pediatrician’s office is backed up and before we know it our kids have missed lunch or snack, or maybe dinner is late and they are HANGRY!!! You know what I’m talking about, right? That moment when your child needs a snack or they will freak out – feeling irritable as a result of being hungry. Tree Top knows that avoiding those hangry moments, or stopping them in their tracks, requires a quick and reliable solution. 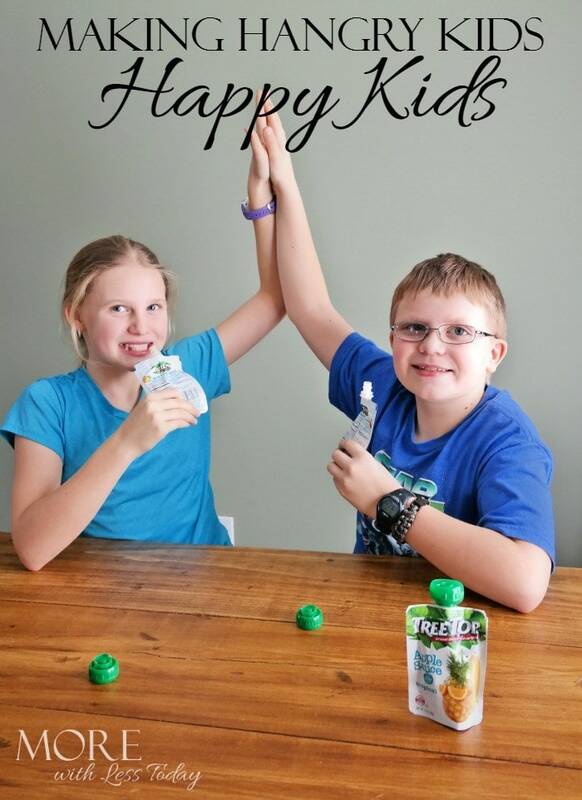 Their apple sauce Pouches can help your kids go from hangry to happy! All of my kids have always loved apple sauce for snack or even for a side with their meals. Traditional apple sauce isn’t always convenient for an on-the-go solution to those hangry moments though. 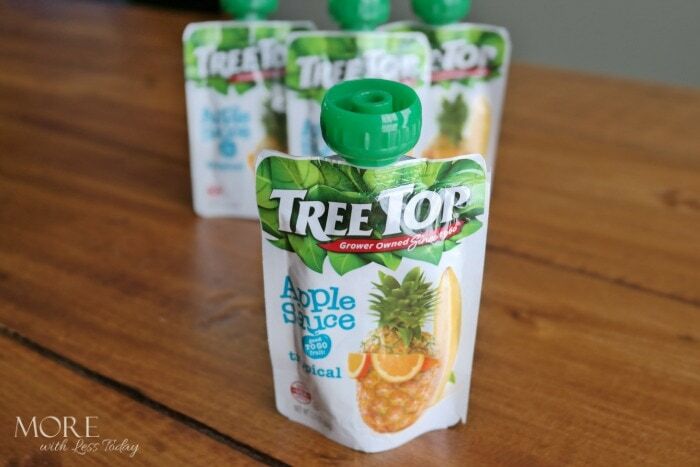 When we need a quick snack solution, Tree Top Apple Sauce Pouches are the answer. They are mess-free, taste great and are made with pure USA-grown fruit and local ingredients. No spoon? No problem! Pouches are squeezable and fun, making them perfect for on-the-go snacking. I love that Tree Top is made with USA-grown fruit and local ingredients. This is so important to me when so many snack foods directed at our children are made in foreign countries and are filled with ingredients we can’t even pronounce! Located in the heart of Washington’s apple country, Tree Top is a grower-owned cooperative, deeply rooted in the communities where we work, live and operate. For more than 50 years, Tree Top has been a trusted brand dedicated to delivering top-quality products and premium ingredients such as juices, smoothies and sauces. When we’ve had a busy day of running errands and been on the go and the kids start to get irritable I reach for the Tree Top Apple Sauce Pouches and know that I can count on them to relieve the grumpiness that is taking over my sweet little people. Whether we’re in the car heading to town, running between soccer fields to catch the next game, or just needing an after school snack at the table while we push through homework, Tree Top Apple Sauce Pouches are “good-to-go” anytime, anywhere Making Hangry Kids Happy Kids! My big kids turn into zombies when they are hangry and I can count on Tree Top Apple Sauce Pouches to turn them back to my happy kids. Share a photo of your child’s “hangry2happy” moment on Facebook, Twitter or Instagram. Make sure you use the #Hangry2Happy hashtag and tag @TreeTopInc in your post so we can check it out! My kids are fans of anything that comes in a pouch! I will have to pick up some of these for them. We are on the go A LOT so I need something healthy and nutritious that can keep in the car. This seems like a great idea! My kids could live on these! They absolutely love them! I love that they are a healthy alternative to other snacks available. Forget the kids. Those look perfect for me. Something like that is perfect for me when I’m doing my computer work all day. I don’t have any kids, but these actually look like they’d be a pretty nice too-busy-to-leave-my-desk midday snack! I would love to try Tree Top applesauce. My kids love applesauce and I see this as a great snack. I need to pick these up for my kids. I always try to keep healthy snacks like yogurt, fruit, veggies, and cheesesticks available. I am thankful my son would rather reach for healthy 90% of the time. I don’t have kids but I know I get pretty hungry sometimes nda could definitely use some applesauce then…LOL!! Great post!! We love the Tree Top apple juice, but we haven’t tried this one, yet. I am sure the girls will love this. 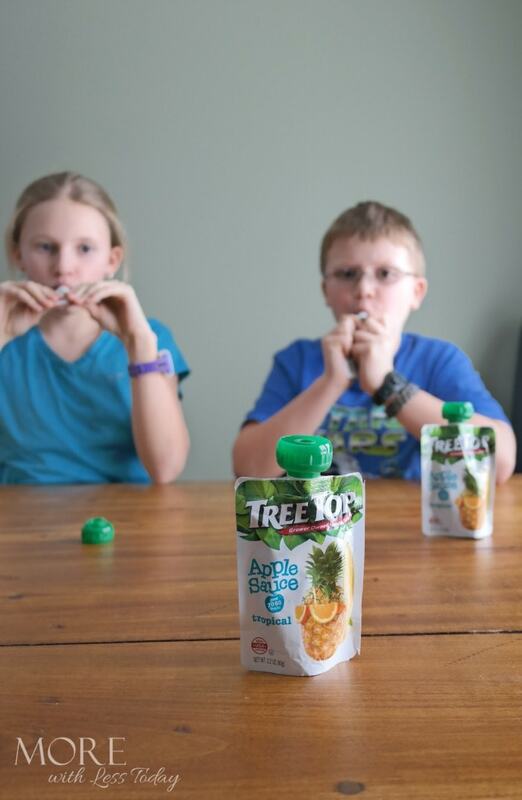 Tree Top looks like a great snack for kids. It would be great for on the go. My sister always has fruit pouches on hand for my nephew. They are perfect for a healthy snack on the go!! These look really good…and healthy too! I often make my own blending fruit, veggies, and yogurt…then I pour the mix into a reusable container. 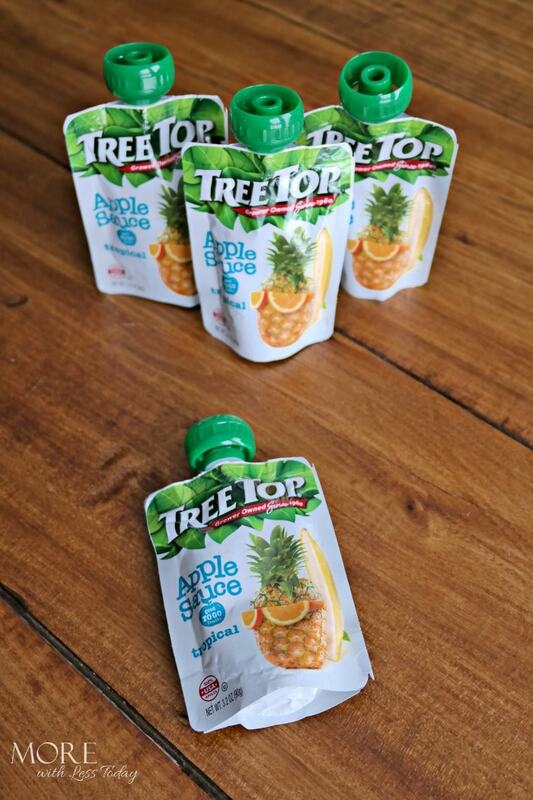 I’ve never heard of tree top, but my daughter does love apple sauce. I will have to buy this for her! !sure she would love it. We have these in our On the Go Bag and in our pantry! The boys love grabbing one of these as an after school snack, when we are on the road or as a snack to hold them over until supper! Great product!